Ornithologist Wulf Gatter spent six days a week observing birds in the forest of Liberia, the West African country. He spotted one seen nowhere else, a medium-sized yellow songbird, on nine occasions during the county’s annual dry season lasting from November to February. It looked quite similar to another species, but had never-before-seen white markings on its wings. 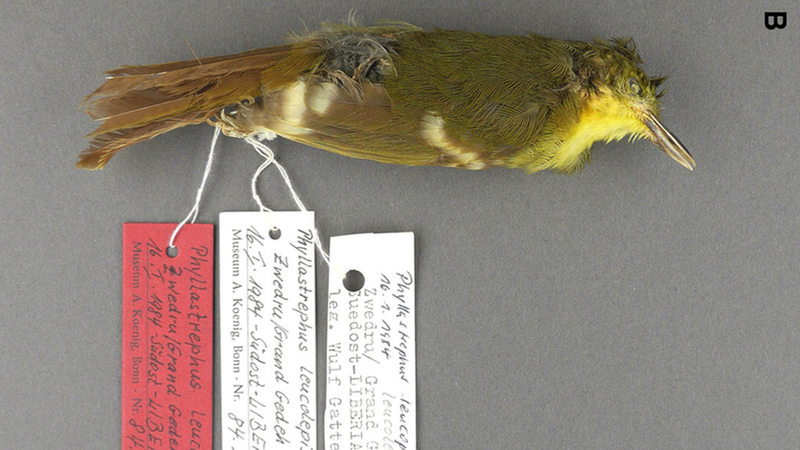 He finally captured a specimen towards the end of his visit in 1984—it seemed like he’d found a whole new species, which he named Phyllastrephus leucolepis, the Liberian Greenbul. Civil wars in 1989 and 2003 made further visits to the forests impossible. Scientists finally returned in 2010 and again in 2013, but could not find another one of Gatter’s Greenbuls—all they had was his one sample, waiting in Germany’s Museum Alexander Koenig. Was the Liberian Greenbul truly a new species, or simply a variant of the more common Icterine Greenbul, Phyllastrephus icterinus? DNA advances have finally allowed scientists to analyze the bird and determine its true identity. “I wrote Birds of Liberia, and traveled all over in Libera and didn’t find it. That was my reason for my decision to ask specialists to prove it,” Gatter told Gizmodo. Unfortunately, a genetic analysis “lead us to the conclusion that the Liberian Greenbul is most likely a plumage variant of the Icterine Greenbul,” according to the paper published over the summer in the Journal of Ornithology. Scientists took DNA from the Liberian Greenbul’s toepads, handled carefully to avoid contamination, and ran standard genetic sequencing tools on it. They determined appropriate markers and compared them to DNA from Icterine Greenbuls acquired in Liberia and Congo. Despite Gatter’s sample’s strange plumage, the DNA was virtually identical.